MINDEN, Nevada - Investigators are probing splintered wreckage to find out why a glider broke apart and spiraled to earth at 200 mph, killing the director of the Smithsonian Institution's National Air and Space Museum and his friend, a world-renowned pilot. Donald Engen, 75, head of the museum, and longtime friend William Ivans, 79, of La Jolla, Calif., died Tuesday when Ivans' motorized glider lost a wing at about 5,000 feet above the floor of the Carson Valley, a mecca for glider pilots. The valley, on the eastern slope of the Sierra Nevada, is one of the premiere areas for sailplanes because of thermal updrafts generated by the Sierra. Bob Francis, vice-chairman of the National Transportation Safety Board, led a federal team that arrived Wednesday from Washington, D.C., and Los Angeles to investigate the crash - the second fatal glider accident in a month here. The NTSB probe could take several months to complete. Francis said investigators will study pieces of the shattered glider that landed a mile apart, the size of the debris field, weather conditions and other factors, as well as talk with eyewitnesses. "Some witnesses said they were experiencing some significant thermal turbulence" at the time, Francis said. Thunderstorms and high winds developed later. He also said Ivans' Nimbus 4DM glider was radio-equipped, but it's uncertain whether there was any transmission as the plane went down. The German-built, dual-control plane also has a type of "black box" flight recorder which will be analyzed. The two victims - Ivans in the front pilot's seat and Enged in the rear - also had parachutes. Francis declined to comment when asked whether they might have been unable to get out of the plane as it rocketed to the ground at an estimated 180-200 mph. He also said NTSB investigators will look into reports that two other gliders similar to Ivans' broke up when speed brakes were used to slow rapid ascents. "To get a break-up, you need some serious forces, whatever it was," he said. Keston Denny, 11, who lives near the crash site, was one of the witnesses. "I saw the airplane take kind of not a violent turn, but it wasn't an easy turn. And then there was a loud noise and the wing snapped off and it fluttered down to the ground," Denny said. "Then the airplane took a really sharp spiral, like a doughnut kind of a turn and then went right over this hill that's right by our house," he said. "I knew that he had crashed and I went in and told my mom and she called 911." Glider pilot Kenny Brieglieb, flying above Ivans' aircraft, also saw the crash. Larry Sanderson, president of the Soaring Society of America, said Brieglieb told him that the plane was "nose down with the wings flexing greatly" before breaking up seconds later. Sanderson, a friend of both victims, said one potential problem is that a wing could stall when a glider makes turns in a thermal - air rising rapidly from a sun-heated surface. Ivans was circling upward in a thermal when his plane broke up, witnesses said. "The same conditions that produce world-class gliding can challenge you as well," Sanderson said, adding that "it had to be a very unusual set of circumstances that stressed the aircraft." Engen had been director of the museum in Washington, D.C., since 1996. He also was administrator of the Federal Aviation Administration from 1984 to 1987, and served for two years on the National Transportation Safety Board. A much-decorated Navy pilot, Engen retired as a vice admiral in 1978. He also served as general manager of Piper Aircraft Corp. He took over as head of the museum after his predecessor, Martin Harwit, resigned in May 1995 over complaints that an exhibit on the dropping of the atomic bomb on Hiroshima was too sympathetic to the Japanese. Air and Space is one of 16 museums and galleries operated by the Smithsonian Institution, and is the most visited museum in the world. MINDEN, Nevada -- When Donald Engen was appointed director of the Smithsonian Institution's National Air and Space Museum, he considered it a wonderful reward for a lifetime dedicated to flight. "This job is a payback for 54 years of flying," Engen said in 1996 when he took over the Washington, D.C., institution and the most visited museum in the world. Engen and longtime friend William Ivans of La Jolla, California, were killed Tuesday when Ivans' glider broke apart and crashed into a field several miles east of Lake Tahoe. Engen was 75, Ivans 79. "They died together doing what they were doing when they first met," said Larry Sanderson, president of the Soaring Society of America and a friend of the men. The two had started flying together in the mid-1980s. Engen was appointed by Smithsonian Secretary I. Michael Heyman. Air and Space is the most popular of the 16 museums and galleries operated by the institution. The former Navy test pilot took over from Martin Harwit, who resigned in May 1995 after some historians and veterans' groups complained that an exhibit on the dropping of the atomic bomb on Hiroshima was too sympathetic to the Japanese. Engen defended a toned-down version of the Enola Gay exhibit against other historians who said it uncritically accepted the view that the bombing saved countless lives by hastening Japan's surrender without a costly U.S. invasion. More recently, Engen was working to raise $130 million to help build new exhibit space near Washington Dulles International Airport. The Dulles Center of the Air and Space Museum is designed to offer state-of-the art restoration facilities and house air and space vehicles simply too large or numerous to fit in the present museum on the National Mall. Exhibits are to include the sleek SR-71 Blackbird, still the fastest aircraft ever built, and the giant Space Shuttle "Enterprise" used as a test vehicle in the 1980s. The aim is to open the new center on December 17, 2003, the 100th anniversary of the Wright Brothers' first flight. As for the Enola Gay, Engen said during a tour of the museum's preservation warehouse this year that he hoped to reassemble the B-29 Superfortress after the Dulles Center is completed. "It will sit front and center in the aircraft hall," he said. A much-decorated Navy pilot, Engen retired as a vice admiral in 1978. He was administrator of the Federal Aviation Administration from 1984 to 1987, and served for two years on the National Transportation Safety Board. At the FAA, Engen levied a series of fines against airlines, including a $9.5 million penalty against Eastern Airlines for alleged safety violations. Engen also revised the way the FAA kept track of near-collision reports to make it more accurate. But critics said that under Engen, the FAA continued to react to safety issues instead of being on top of them. Engen left the FAA amid reports of a stormy relationship with then-Secretary of Transportation Elizabeth Dole, who is now seeking the Republican nomination for the 2000 presidential race. Engen later told a Senate panel that while he headed FAA, the Transportation Department sometimes added months to the time his agency needed to implement new air safety regulations. The FAA is a branch of the department. Engen, who lived in Arlington, Virginia, was married and had four children. 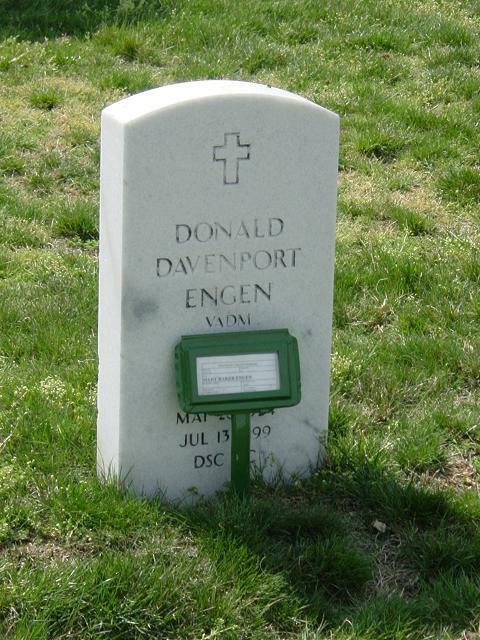 Admiral Engen's funeral will be held on Friday, July 23, 1999, 9:30 a.m., at the Washington National Cathedral. The Cathedral is located at the corner of Wisconsin and Massachusetts Avenues. Parking is available in the neighborhoods north of Cathedral off of Wisconsin Avenue. It takes time to find a place and walk to the Cathedral so allow extra time. Interment will be at Arlington National Cemetery at 11:30 a.m. There will be a motorcade from the Cathedral to Arlington. There will be a reception at the Museum at 1:00 p.m. Please RSVP by noon Wednesday, July 21. Maps will be provided at the Cathedral showing the motorcade route, as well as the route to the Museum and nearby parking garages. Bus Transportation will be available to the Cathedral from the National Air and Space Museum. There will also be buses at the Cathedral to take attendees to Arlington and the Museum, but reservations are required to ensure enough buses are scheduled. Please specify where you plan to board the buses. It was clear skies, sparkling waters, and a most particular man that drew a capacity crowd to Boston's historic harbor and Anthony's Pier 4. Vice Admiral Donald. D. Engen came to be honored with the prestigious Godfrey L. Cabot Award for his very full lifetime of achievements and contributions to aviation. Retired from active duty in the Navy, he is currently the Director of the Smithsonian's Air and Space Museum. David Graham spoke about Admiral Engen's accomplishments, Club President Reese Dill introduced him, and John G. L. Cabot presented him with the Godfrey Lowell Cabot Award Trophy. Admiral Engen was clearly delighted with the honor and event, and most pleased to meet, speak with, and shake hands with attendees. The group crowd hugely enjoyed meeting and hearing this accomplished American: Naval officer, historian, and quintessential pilot. Admiral Engen joins such past aviation greats as Igor Sikorsky, General James Doolittle, and General Charles Yeager in receiving the Godfrey L. Cabot award. Among the past winners and admirers there to honor Admiral Engen were some of aviation's most high profile and influential, including senior NTSB officials Robert T. Francis, Robert Goglian, and our own Massport's Peter Blute. Admiral Engen had a long and distinguished career in the Navy, starting in 1942 when he entered as Seaman Second Class. During his career as a Naval aviator he was awarded 29 decorations, including the Navy Cross. In 1978 he retired as Vice Admiral; he was then serving as Deputy Commander-In-Chief of the U.S. Atlantic Command and the U.S. Fleet. In 1984, he was appointed Administrator of the FAA by President Reagan and held that position for three years. Before that he served as President of the AOPA Air and Safety Foundation and served for two years on the National Transportation Safety Board. He also served in industry and general aviation as General Manager of Piper Aircraft, Lakeland Division and as Director of Government Operations for Piper's Corporate Division. For his achievements as an engineering test pilot Admiral Engen was inducted into the Test Pilot Hall of Fame. He received the Doolittle Award for Technical Management and was honored by the NAA as an Elder Statesman of Aviation. And in 1992 he was recognized abroad for his accomplishments when the Soviet Union awarded him the Yuri Gagarin Gold Air and Space Medal for his lifetime work in aviation. Of the tales Engen told during his acceptance speech, this one captured us the most. During his war years doing carrier duty, he had occasion to strafe and sink a Japanese warship-one that had been particularly troublesome to the US fleets. Many years later, while on business in Japan, he happened to meet and negotiate with a Japanese businessman. They spoke lightly of the war, asking each other studiously and politely of their experiences. Engen told of his strafing successes in the Pacific theater. The Japanese related that he had been stationed aboard Japan's finest carrier as a kamikaze pilot, but his ship had been sunk out from under him by a U.S. Naval aircraft fighter before he could fly his mission. Engen asked the name of the ship. It was one he had sunk, and he said so. Their eyes riveted on each other thoughtfully. The Japanese commander- his life inadvertently saved by Engen-had obviously survived to play a role of peacetime leadership. At a loss as to what to say next, Engen cleared his throat and asked, "Uh, how long were you in the water?" On July 13, 1999, at 1310 hours Pacific daylight time, a Schempp-Hirth Nimbus 4DM motorized glider, N807BB, experienced an in-flight breakup while maneuvering near Minden, Nevada. The commercial glider pilot and a passenger were fatally injured and the glider was destroyed. The personal flight was operated by the owner/pilot under the provisions of 14 CFR Part 91. No flight plan was filed for the local flight. The glider is certificated in the United States in the experimental category for exhibition and racing. A production glider in Germany, a standard-utility category airworthiness certificate was issued by the German civil aviation authority. The glider departed from Minden airport at 1240. A glider pilot witness stated he was soaring about 1,000 feet below the accident glider. The witness observed the glider in a high-speed spiral with a 45-degree nose down attitude. After two full rotations, the rotation stopped, the flight stabilized on a north easterly heading, and the nose pitched further down to a near vertical attitude. The glider was observed to level its attitude, with the wings bending upward and the wing tips coning higher. The outboard wing tip panels departed from the glider, the wings disintegrated, and the fuselage dove into the ground. Other witnesses have subsequently stated the glider was in a tight turn, as if climbing in a thermal, when it entered the spiral. The glider appeared to be recovering from a spin. A second witness was in another glider between 9,000 and 10,000 feet and observed portions of the accident sequence. He immediately headed for the airport to report the accident and encountered "very turbulent" conditions with a sudden 40-knot airspeed increase. He characterized the conditions as "more choppy than normal" and further stated that "controllability was not unmanageable but was rough." The glider is composite construction. Reconstruction of the glider revealed that all primary and secondary flight control surfaces, including mass balance weights, were within the wreckage distribution path. Control system continuity was established. Mary Baker Engen, 80, a board member at the Smithsonian National Air and Space Museum, died of cancer February 6, 2006, at her daughter's home in West Chester, Pennsylvania. She lived in Alexandria. 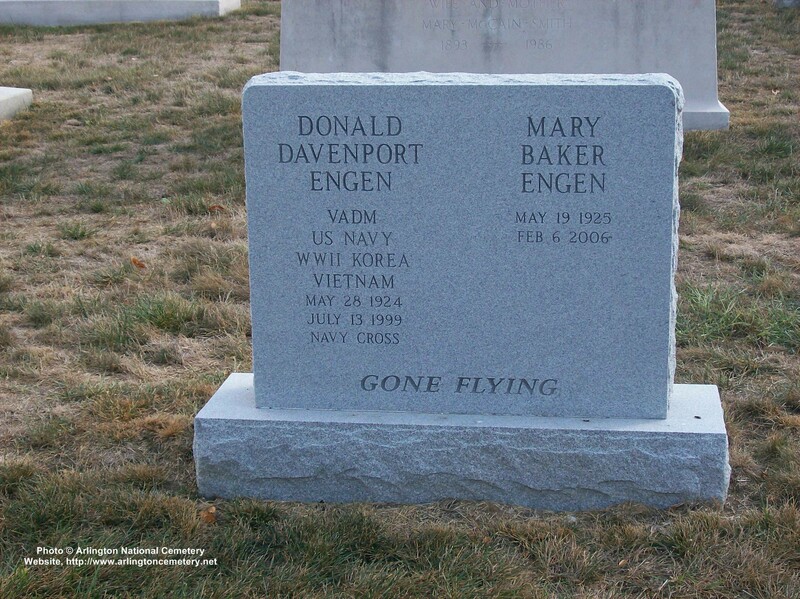 Mrs. Engen became a member of the museum board in 1999, after the death of her husband, Donald D. Engen, the former Federal Aviation Administration director. She was born in Minneapolis and grew up in Pasadena, Calif. She married after high school and was a Navy wife, moving with her family more than 25 times. She volunteered at naval medical facilities in those various posts and also acquired Old English sheepdogs. While her husband was director of the Air and Space Museum, she worked with him on planning and fundraising for the Steven F. Udvar-Hazy Center at Dulles International Airport. She and her husband in 1988 participated in one of the early People-to-People tours of China. Survivors include four children, Travis Engen of New Canaan, Conn., Candace Engen Ellis of West Chester, Pa., Chris Engen of Rolling Hills Estates, Calif. and Charlie Engen of Simi Valley, Calif.; six grandchildren; and one great-grandson.